290 in stock Need More ? Reprint. Originally published: U.S.: Portfolio, 2007. 'Most people just laugh when they hear that the secret to success is giving . . . Then again, most people are nowhere near as successful as they wish they were. 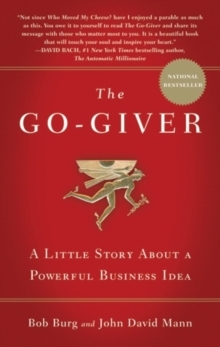 'The Go-Giver tells the story of an ambitious young man named Joe who yearns for success. Joe is a true go-getter, though sometimes he feels as if the harder and faster he works, the further away his goals seem to be. One day, desparate to land a key sale at the end of a bad quarter, he seeks advice from the enigmatic Pindar, a legendary consultant referred to by many devotees sinply as the Chairman. Over the next week, Pindar introduces Joe to a series of successful 'go-givers' who teach him how to open himself up to the power of giving. Joe learns that changing his focus from getting to giving - putting others' interests first and continually adding value to their lives - ultimately leads to unexpected results. This revised and updated edition includes a foreword by Arianna Huffington; a new preface; a Q&A addressing some of the many questions about the book the author has received from fans and a reader's guide. 'Most people don't have the guts to buy this book, never mind the will to follow through and actually use it.